United States Central Command (CENTCOM) said today evidence clearly indicates that ISIL did not down the aircraft over Syria as the insurgent group is claiming. 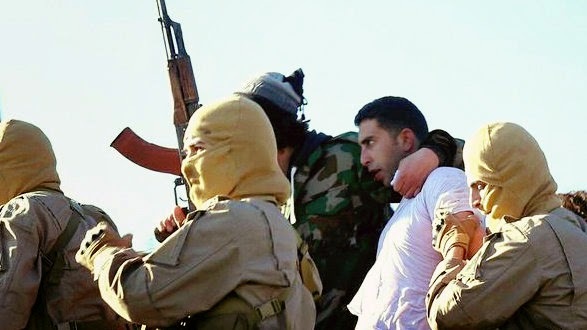 The Jordanian F-16 aircraft crashed in the vicinity of the northern Syrian city of Raqqah today and the pilot, identified as First Lieutenant Moaz al-Kasasbeh, was taken captive by ISIL forces. CENTCOM did not say what caused the crash. The ISIS terrorists had captured over $20 billion of US weaponry abandoned or take over from Iraqi fleeing forces and that includes medium range SAM batteries and Manpads. It was only a question of time before they figured out how to use them since a number of Saddam era officers are assisting ISIS. Jordan is most likely the next ISIS target anyway and 70% of its population is Palestinians who are very uncomfortable with Jordan's overt interference in Syria and hosting foreign troops and training alNusra terrorists. who told you that " ISIS terrorists had captured over $20 billion of US weaponry "? where did you get that dollar figure? Defense News previously quoted unnamed Jordanian security official stating RJAF F-16 shot down by ISIL. That said, Defense News has an unreliable record in defense related reporting. As ISIS sweeps through Iraq and Syria, the US media published chart shows what the US trained and collapsing forces cost— who American's spent $20 billion training — simply collapsed and U.S.-made weapons and armored Humvees, M1 Abrams tanks, artillery, APC, MRAP vehicles, enough small arms to arm 4 divisions, along with helicopter and aircraft from airports were captured. The real cost o the US failure and loss of weaponry to ISIS and now on-going operations, the cost may even be higher at $40 billion. The shooting down of the Jordanian F-16 alone would be in the neighborhood of $20 million. Modern wars have a voracious appetite, and the US has a history of abandoning billions in weaponry in lost wars. In Vietnam they left over $9 billion (current dollar worth $ 70 billion) worth of equipment, including modern aircraft like F-4 and F5 which even Iran bought during the Iran-Iraq war for spares and replacements. The loss of weapons in Iraq would haunt the region for years. Yes ISIL did get truckloads of weapons and ammunition from Iraq and took it to Syria. This included US and Russian tanks plus various types of armoured vehicles, artillery, heavy machine guns, plus lots of other stuff. ISIL even got lots of well trained Iraqi troops who were Sunni Muslims where they deserted and joined Sunni ISIL, and ISIL allowed these troops to keep the weapons that they had been well trained with, and that's how ISIL very quickly became a much larger force and conquered Iraq so quickly up to the doorstep of Baghdad. BUT as for Iraq's SAM batteries they were ALL wiped out at the very beginning of the previous Iraq war when the US and coalition countries planes invaded and quickly had complete dominance of the sky. When the war finished the US stayed and provided Iraq with air protection so no SAM batteries were built or repaired as any money was needed for other things to rebuild the country. As ISIL invaded just after the US left Iraq still had not done anything with SAM batteries and any money for defense was spent on other things. If any SA-6 survived and ISIL got them then they would immediately be detected when their radar was turned on, and they would be wiped out just like before. As far as I know, NO radar for SAM batteries has ever been detected from ISIL's territory. Manpads and AAA simply have NOT got the altitude range to reach the US and coalition planes as they already are flying at HIGH altitude when they enter the Syria or Iraq. Syrian and Iraqi planes and helicopters well that's different as ISIL could reach them when they are flying at low altitude such as near airports when landing or taking off, and helicopters only fly at low altitudes. One of the best manpads Iraq had and ISIL got was the Igla-1E (SA-16) Maximum Range 16,000 feet (5,000 meters), and simply the US and coalition planes are flying and bombing with JDAM and LJDAM bombs well above that height and there is absolutely no reason for them to fly below 20,000 feet. On TV we all have seen them bombing with GPS bombs where the pilot targets through a little targeting screen this when the plane is at a HIGH altitude. Targets can even be spotted using a Iraqi infantryman who has a radio to the pilot and a GSP target designator, and those LJDAM bombs could even be dropped from 50,000 feet. The US is training Iraqi troops, Kurd Peshmerga troops, and which I think includes some troops to be Joint Terminal Attack Controllers (JTACs) who are trained to call in such air strikes. Due to the above I do think that ISIL did NOT shoot that Jordan F-16 down as they are using such JDAM bombs from HIGH and flying in HIGH from Jordan, but that plane was going down to crash due to some mechanical problem and the pilot parachuted out, and when the plane got down to the range of the manpads and AAA it was then that ISIL fired at it where ISIL might have hit it then. They also denied that the RQ-170 was intentionally brouight down by the Iranian military, but that it was a malfunction or that Iran had shown a faked copy........, as well as that downed F-117 over Serbia was an accident according to initial statements. +A, it's good that you always question the veracity of government reports, except that you never do the same with the official reports coming from Islamic Republic. Would you care to explain? Everything about the US RQ-170 Iran incident is public knowledge at this address. Has the US sent any more of those drones and has Iran brought any more drones down? As for Jordan's F-16, the US and coallition countries intend to still keep on bombing ISIL. From the 8th August 2014 till now the US and coalition countries have done hundreds of airstrike missions over Syria and Iraq. The US alone and just in Syria the US has done 488 airstrikes missions. So if ISIL can now shoot down those planes and considering ISIL has lots of manpads and AAA, then we should start hearing daily reports of ISIL shooting down US and coallition planes. ISIL would love to shoot down those US Super Hornets and Raptors. Now also over ISIL is an air-to-air refueling tanker plus a large intel gathering plane and ISIL would love to shoot those down. What is going on is just properganda, what really matters is what happens to Jordan's pilot who did land safely and was captured by ISIL. Now the question is will the pilot remain safe or will ISIL later kill him?